MARINE CORPS BASE QUANTICO — The Marine Corps is nearing a downselect from five to two competitors in its Amphibious Combat Vehicle 1.1 program in mid-November, after years of work on the ACV and its Marine Personnel Carrier predecessor. The wheeled vehicle will carry a crew of three and at least 11 embarked Marines, have the robust swim capability of the legacy Amphibious Assault Vehicle, and protect against roadside bombs and other threats while driving on land. After a few failed tries to replace the AAV, the Marine Corps settled on its current strategy – to get an ACV 1.1 increment out quickly, based on proven designs; to upgrade to an ACV 1.2 next, with the ability to launch and recover from amphibious ships and with the addition of mission-specific variants; and finally to make a decision on moving to a high water speed ACV 2.0 in the 2025 timeframe, pending the outcome of research and development efforts over the next decade. Manny Pacheco, spokesman for the Marines’ Program Executive Office for Land Systems, told USNI News at the annual Modern Day Marine expo that ACV 1.1 is on track for a milestone B decision to move into engineering and manufacturing development in mid-November. Each of the two EMD contract winners would deliver 16 prototype vehicles within nine or 10 months, and the Marines would spend 24 to 30 months testing those vehicles and soliciting feedback from Marines involved in the testing to begin developing tactics, techniques and procedures for that specific design. “Part of the reason why we’re getting 16 vehicles from each manufacturer is to be able to maximize the testing in the shortest amount of time that we can,” Pacheco said. A decision to move into low-rate initial production is expected in the second quarter of Fiscal Year 2018, with the program reaching initial operational capability (IOC) at the end of 2020 and the ACV 1.1 acquisition program ending in 2023, Pacheco said. As the five competitors await a decision, four of them showed off their prototypes at Modern Day Marine – with four different approaches to force protection, balancing water and land mobility and setting the Marine Corps on the right path to transition to ACV 1.2. BAE Systems partnered with Italian defense contractor Iveco, which had already outfitted Italian Marines with the SuperAV personnel carrier. 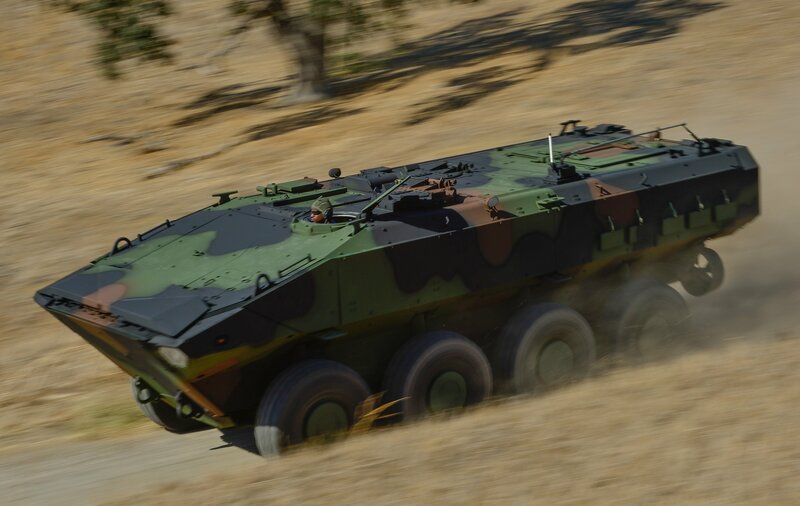 Though the U.S. Marine Corps will operate ACVs and legacy AAVs side-by-side for some amount of time, the Italians selected Iveco’s design as an AAV replacement. “The Italian requirement was to, quote unquote, replace the AAV. And that made perfect sense to us, because as we read the Marine Corps requirement for 1.1 we were like, well wait, this is only a half step away from being an AAV replacement,” ACV program manager John Swift told reporters at Modern Day Marine. “So we may as well ensure our design can meet all the AAV requirements, except to go well beyond the survivability requirement of the current AAV or even the upgraded AAV,” he said, referring to an ongoing AAV survivability upgrade effort. Swift said the BAE Systems offering includes Iveco’s proven H-Drive System that provides power to individual wheels – allowing the vehicle to continue operating if a blast damaged any wheels, and allowing the wheeled vehicle to simulate a tracked vehicle for better mobility in soft soil or sand. The H-Drive System has no axels, allowing the vehicle to have a V-shaped hull for blast protection, Swift added. For added force protection, the floor that the Marines stand on inside the vehicle is not actually connected to the hull. Rather, it bolts onto the bottom of the seats, creating somewhat less headroom when walking in and out of the vehicle but protecting the Marines’ feet from absorbing any energy from a blast below the vehicle. Key to BAE Systems’ bid is that the vehicle has already been proven to meet not only the 1.1 requirements but also most of the 1.2 requirements. ACV 1.2 is expected to include seats for 13, not 11, embarked Marines, so BAE Systems already has its vehicle configured for 13 seats. ACV 1.2 will have to launch and recover from the well deck of an amphibious ship, and the Italians are already doing this with the SuperAV. And ACV 1.2 will create mission-specific variants of the vehicle, such as a turreted ACV – and the Italians have already integrated an unmanned 30mm turret onto some of their vehicles. For Swift, the combination of the Italians’ success with SuperAV, plus BAE Systems having served as the original equipment manufacturer for all the Marines’ amphibious vehicles since 1939, creates a path to success not only in ACV 1.1 but 1.2 and beyond. 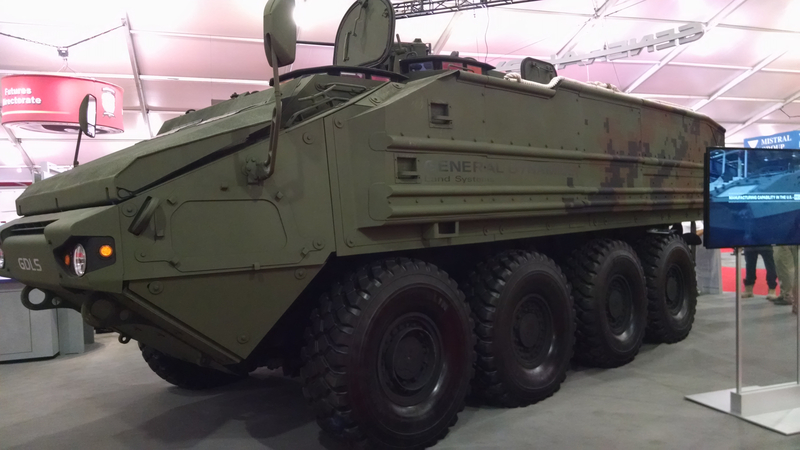 Lockheed Martin’s ACV entrant is touted as a simple design that focuses on off-road missions while ensuring a robust swim capability for years to come. Frank Bohlmann, director of ground vehicle weapon systems, told USNI News that the company has worked on the ACV and MPC programs for a combined eight years now and rolled all the user feedback received during that time into the current design. ACV program manager Patrick Shepherd said that the Marines intend to operate the vehicles on roads 20 percent of the time and off-road 80 percent, so Lockheed Martin focused on off-road mobility and survivability. The frame can adjust its height to ride low to the ground for greater speed on paved roads or higher up for a smoother ride off-road, he said. And the tires can flatten when operating in an urban environment to avoid ripping up the local infrastructure. Similar to the BAE Systems offering, Havoc has a raised interior floor that does not attach to the bottom of the vehicle for additional blast protection while operating on land. For water operations, Lockheed Martin has added reserve buoyancy packs to the outside of the vehicle, giving 25 percent reserve buoyancy – which is more than the Marines required. Combined with a 711-horsepower Caterpillar C13 engine – the largest of the four competitors – and user-friendly independent thrusters in the water, the company is offering “plenty of power, plenty of reserve buoyancy, and we’ve got a suspension that can handle up to 25-percent weight growth, so we think we’ve got a very very capable vehicle” with plenty of room to accommodate future modifications, Bohlmann said. In addition to room for future growth, Shepherd said another key feature is simplicity. “To keep it relevant, we’ve actually kept it very simple. A lot of companies will make a very integrated digital display, touch screens – we’ve kind of gone to the other end where all the smarts is behind the scenes,” he said. 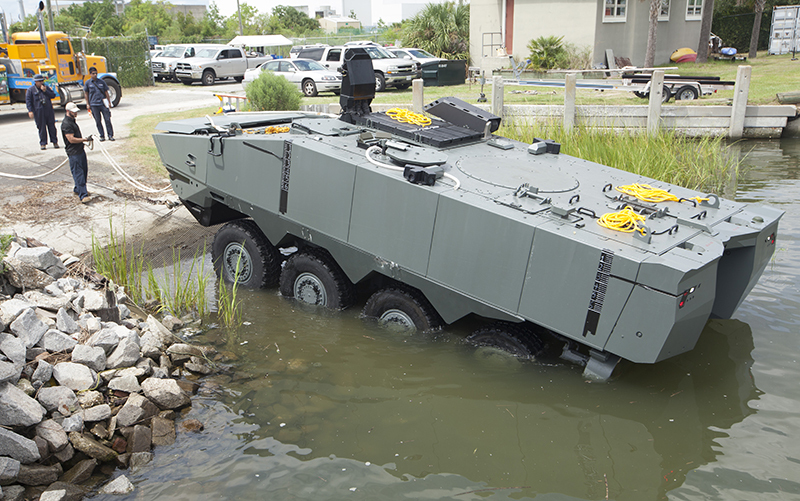 TERREX 2 completes swim test in Charleston, South Carolina. Photo courtesy SAIC. In contrast to the user-friendly simplicity Lockheed Martin aims for, SAIC designed its TERREX 2 vehicle to enhance operators’ situational awareness. The troop commander’s seat is back with the embarked Marines, and the commander’s station is equipped with a screen displaying day/night images from a front, rear, left and right camera outside the vehicle. The 11 embarked Marines can all see the troop commander’s screen, giving them an idea of what to expect when they exit the vehicle. Additionally, the driver’s station features an array of screens – some of them redundant, in case one is damaged – with obstacle avoidance features, situational awareness sensor feeds and more. SAIC and its partner ST Kinetics chose to emphasize ground operations, where the ACV will spend the bulk of its time, whereas other competitors highlighted their entrants’ launch and recovery and other sea-based capabilities, senior director Bernie Ellis told USNI News. “It’s going to spend anywhere from two to five percent of its time in the water, so you have to design it to meet the minimum requirements in terms of safely operating in the sea,” Ellis said. Ellis said the vehicle has a V-over-V hull, which creates a crush zone to reduce the impact of a blast on the floor. Marines would put their feet on footrests attached to the seat across the aisle from them to keep their feet from absorbing any energy from an under-belly blast. This design – compared to the BAE Systems and Lockheed Martin design where the floor the troops walk on isn’t actually connected to the bottom of the vehicle and wouldn’t absorb any blast energy – means the troops cannot keep their feet on the ground during transit but also creates a more spacious interior while the Marines are entering and exiting and arranging their supplies. The General Dynamics prototype features a roomy interior, much like the SAIC vehicle, with a lower floor to create more room and footrests to keep the Marines from blast energy. 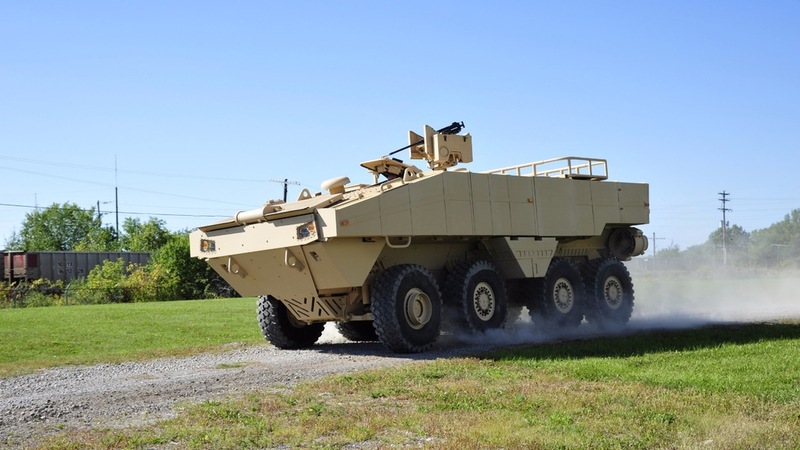 With a 600 horsepower engine, double-V hull design used on other ground vehicles and speeds at least equal to the legacy AAV, the General Dynamics ACV is “focused on performance, protection and payload,” Stilson said. “I think the real distinguishing feature is really the balanced design. Being able to do everything really well, and the energy that it takes to come up with that design, to me that’s actually what separates us,” he said, attributing that success to both General Dynamics’ robust systems engineering teams as well as an eagerness to incorporate user feedback throughout all the MPC and ACV testing periods. The company conducted extensive trade studies to find the right balance between weight, protection and performance; water and land capabilities; and other tradeoffs. “This isn’t what GD wanted necessarily, we listened to the Marine and tried to incorporate that also into the trade studies so they have a vehicle that meets their needs,” he said. The fifth competitor, Advanced Defense Vehicle Systems, did not bring its vehicle to Modern Day Marine.